As “Western” and modern as much of Bali presents itself, the native culture of Bali provides a firm and tangible bedrock on which Balinese behavior and relationships are built. So if you’re going to visit Bali with a mind to visiting the island’s temples and meeting the local people, you’ll need to mind your manners to stay on good terms with the locals. Follow these tips to maintain smooth interpersonal relationships in Bali, wherever you go in the island. For other dos and don’t’s in Bali, read our articles on Safety Tips in Bali, Beach Safety Tips in Bali, and Health Tips in Bali. Dress and act modestly. 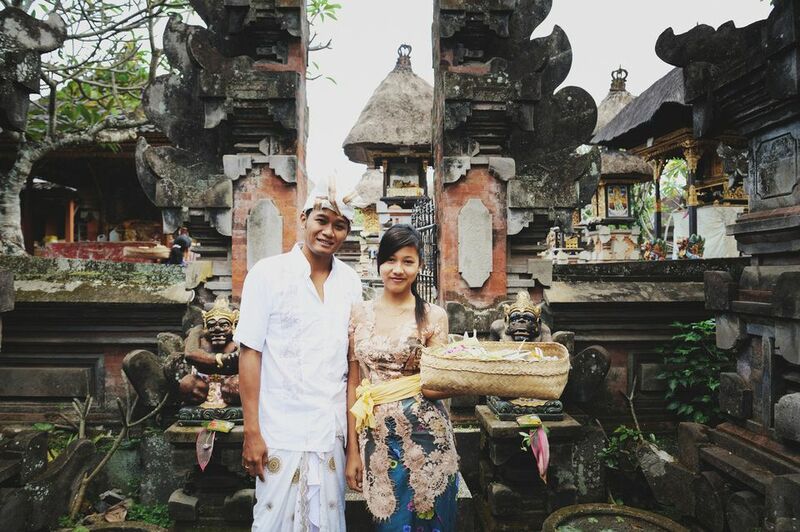 Balinese locals are far more conservative than most Westerners; they frown on public displays of affection. So when in or near Balinese temples or rural settlements, keep the touchy-feely stuff to a minimum. The same goes with clothing: dress as modestly as possible, especially when visiting temples. When paying a visit to a Balinese temple, both men and women are expected to wear shirts that cover shoulders and part of the upper arms. Flip-flops are perfectly acceptable, so long as the overall look is modest. These items are usually rented out at most temple entrances, but you’re absolutely free to bring your own. Read more about Balinese holy sites: Pura Luhur Uluwatu, Pura Besakih and Goa Gajah. Don’t use your left hand to touch or give. This precaution has to do with the left hand being used primarily for hygienic purposes. Balinese traditionally don’t use toilet paper, using water to wash up instead; the left hand “does the business” of washing up the nether regions. Thus the left hand is somewhat polluted, and should never be used to touch other people or to hand something over. The exception is when you use both hands to hand something over to someone; this is considered a high compliment. Don’t use your index finger to point or to beckon. If you need to call attention to someone, beckon him/her to come by extending your hand and, with palm facing down, making a downward wave. If you need to point at something, loosely grip/cup your fingers and point using your thumb instead of your index finger. Don't lose your temper. The Balinese believe that raising one's voice is vulgar, being confrontational is offensive, and losing one's temper is simply shameful. Bali locals never show anger or passion openly, and find the Western tendency towards loudness and open emotion somewhat offensive. Don’t touch people's heads. The soul is supposed to reside in one’s head, making it off limits for people to touch. Not even children (Balinese children, that is) should be touched on their heads, so no noogies. Don’t enter any temple if you’re menstruating. This may be galling to any woman, but you have a whole island’s culture against you on this one. Any woman on her period, or anyone (regardless of gender) with a running sore or bleeding wound for that matter, is considered impure and not to be allowed into any Balinese temple. Don’t step on offerings (canang sari) in the street. Canang sari are offered to the Creator by locals first thing in the morning. When stepping out, you’ll find these little packages of woven palm leaf, flowers and herbs everywhere, even on sidewalks and stairs. Stepping on one can be deeply offensive to any Balinese who witnesses your misstep. So watch where you step around Bali, especially in the earlier part of the day, so you avoid stepping on canang sari. Don’t interrupt any religious processions. Religious processions in Bali occur fairly regularly, particularly during high holy days like Galungan and Nyepi. These Balinese religious processions take precedence over your trip, no question. So if you’re stuck behind a procession on a narrow road, do not honk your horn or otherwise cause a ruckus. Inside a Balinese temple, there are a few rules you should follow to maintain proper behavior during any religious event. The level of your head should never be higher than that of the priest, for instance. Avoid using flash photography in the temple. And under no circumstance should you walk in front of praying Balinese! Why is Bali's Culture so Fascinating?